A number of men have contracts on their heads. 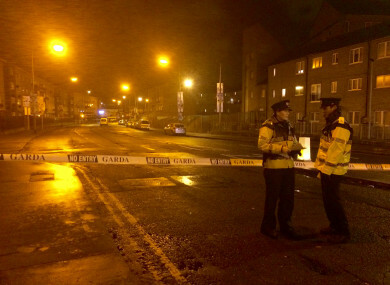 Gardaí at the scene of a gangland shooting last year. THE KINAHAN CARTEL’s Dublin gang – a once meticulous and careful group of criminals – is on the verge of imploding as paranoia sets in among the drug traffickers. TheJournal.ie understands that at least five of the men who are running the drug ring have ordered the murder of associates who once would have been considered close friends. The men, each of whom has a price on his head ranging from €50,000 to €150,000, are all aware that they are in danger. Gardaí have given each of them Garda Information Messages (GIM) – a legal requirement to inform people that their lives are at risk. Gardaí have, in recent months, made a number of significant arrests, some of which have resulted in serious charges being brought against alleged criminals. These arrests have seriously hindered the cartel’s work in the capital and have helped create a heightened sense of paranoia among those who direct the flow of drugs into the city. Large drug seizures in west and south Dublin have also raised tensions in the area as each Dublin faction of the cartel suspects the other. While it could be suggested that this information about the planned hits was released in a bid to ‘divide and conquer’ the gang, the details have been confirmed by a number of security sources as well as by people involved in the feud in the south inner city. Any success a local gang has now raises suspicion. As one source put it, the thought process is that if one gang’s consignments are getting though, there must be cooperation at another level. That isn’t to say gardaí are turning a blind eye to drug enforcement just because a criminal tells them information. Instead, the suspicion is that newcomers, who can help ensure safe passage of the drugs through ports and airports, are now being bribed and can be easily pressured into giving up information regarding the cartel. A number of those whose lives are at risk fled the country after a gangland murder last year, fearing they would be arrested. Two men are still living in Dublin and have heavy garda patrols around them. The thinking on the streets of south inner city Dublin is that the Kinahan gang, in its current form, is over. The leader of the gang is now in the process of restructuring the gang in a way which will safeguard future drug consignments into Ireland. Gardaí believe that while the feud with the Hutches is continuing, there will be bloodshed within the gang itself in the coming months. Recently, the cartel took a hit after two of its members were arrested in Dublin. The two men, aged 34 and 38, were arrested at the scene on the Kylemore Road in Ballyfermot at the start of this month on suspicion of conspiracy to murder. A loaded gun was recovered. Comments on this article have been closed for legal reasons. Email “Informants and paranoia: The implosion of the Kinahan gang's Dublin lieutenants ”. Feedback on “Informants and paranoia: The implosion of the Kinahan gang's Dublin lieutenants ”.